With the sole exception of inventory, every market metric showed continued improvement during May. The number of signed purchase agreements in the 13-county Twin Cities increased 19.5 percent to 6,228. That marks the highest May pending sales count since 2005. Sellers, however, were only slightly more active than last year. New listings rose 0.3 percent to 8,590 for the month. Excluding April 2015, that’s the highest number of new listings for any month since the home buyer tax credit period of April 2010. Homes also sold in less time and sellers yielded a higher share of their list price. The May 2015 median sales price of all MLS home sales increased 6.7 percent to $224,000. That’s within 3.6 percent of the May 2006 level and 6.3 percent of the record high seen in June 2006. Price per square foot offers a different perspective, as it accounts for the increasing square footage of homes selling. The average price buyers paid per square foot rose 3.5 percent to $128. Persistent rent hikes, low mortgage rates, solid job growth and some noticeable wage growth are all encouraging consumers to seriously consider homeownership. But sellers and builders have been reluctant to list and build at the same levels they did when demand was this high 10 years ago. That has kept us in a seller’s market for some time. The number of days a listing spends on the market also reflects this. Those selling their homes are waiting a median of 35 days before accepting an offer at a median of 99.5 percent of their current list price. May months supply of inventory fell 12.2 percent to 3.6 months. Markets with between five and six months of supply are considered balanced. Over the last 12 months, buyer activity increased the most in the townhome segment, where properties are also selling the fastest. Condominium prices increased the most of any property type over the same period. New construction pending sales for May increased at about half the rate of previously-owned properties. The number of homes on the market in May fell for all property and construction types. The finance environment remains attractive. Mortgage rates are hovering around 4.0 percent, compared with a long-term average of 7.0 percent. 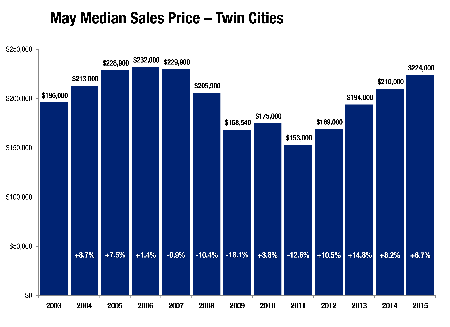 The Twin Cities housing affordability index increased 2.7 percent since May 2014. An educated and literate workforce combined with a healthy and diverse economy helps Minnesota compete for top talent and businesses on an international scale.